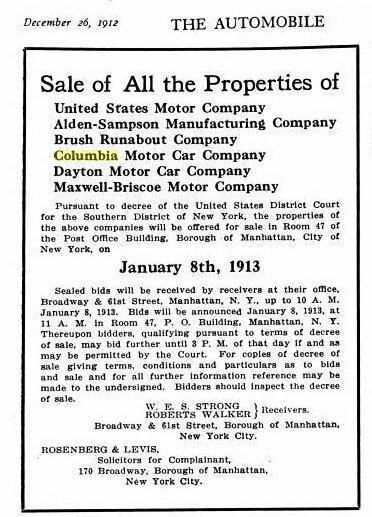 Columbia 1913 - The end of the line . . . . . . 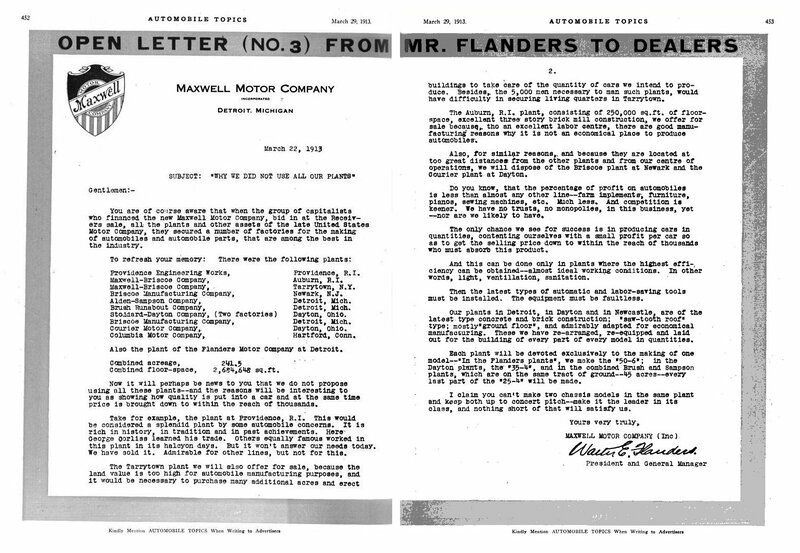 The End of the Line . 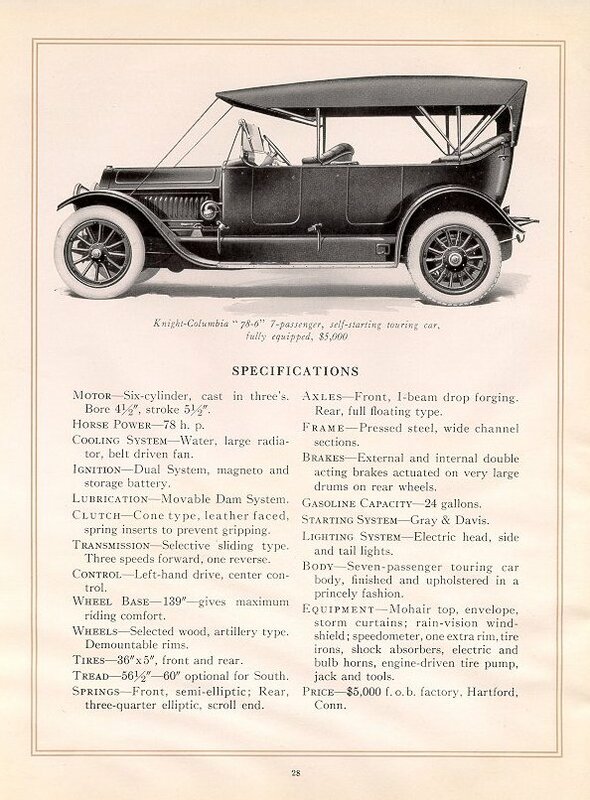 . .
1913 was the final season of the original Columbia car. 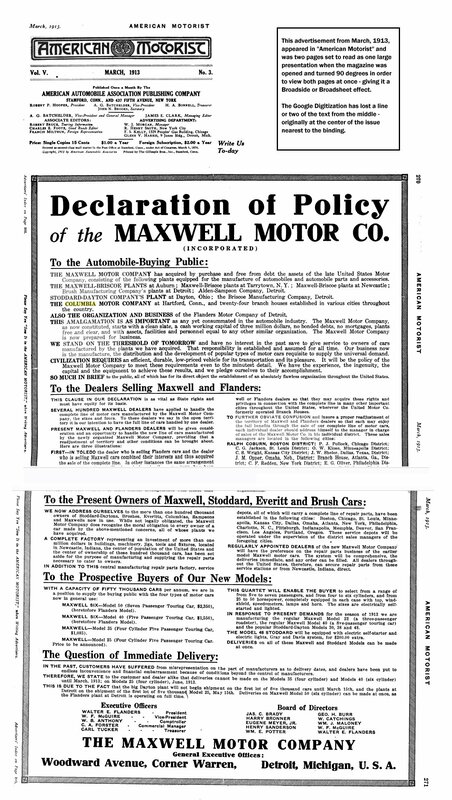 but were distributed by Maxwell. 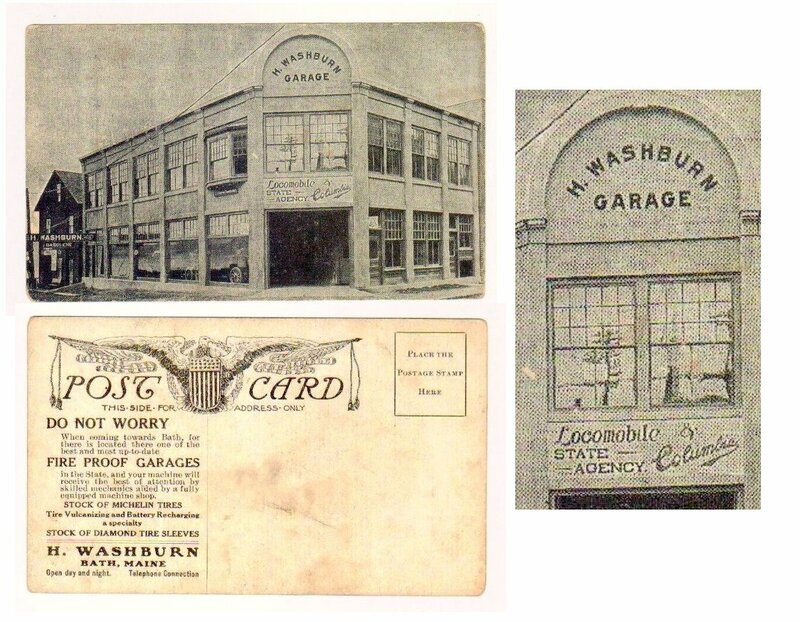 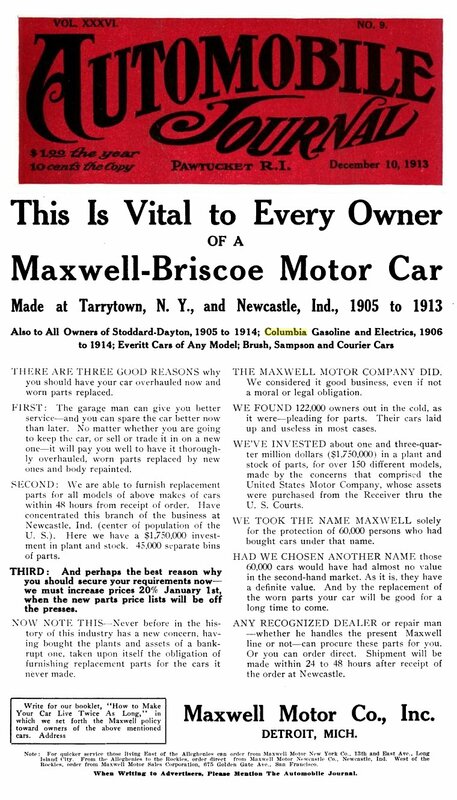 Established in Tarrytown, New York in the early years of the 20th century by Jonathan Dixon Maxwell, formerly of Oldsmobile and Benjamin Briscoe, the Maxwell-Briscoe Company was one of the pioneer American automobile manufacturers. 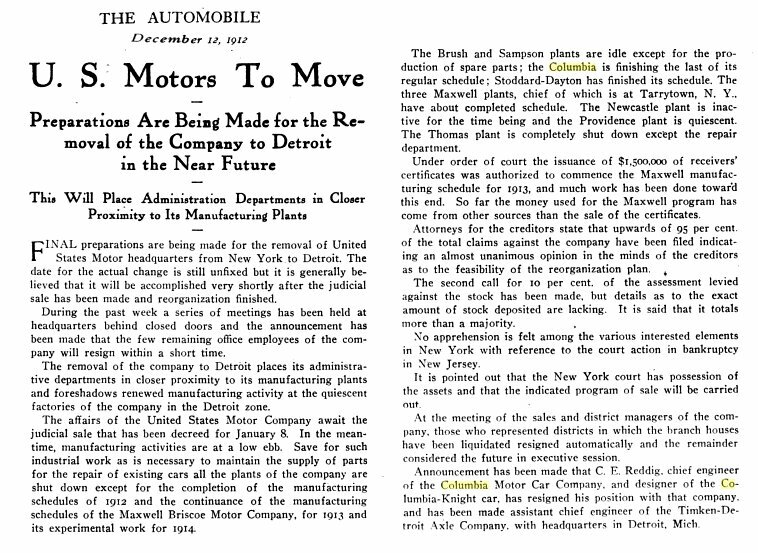 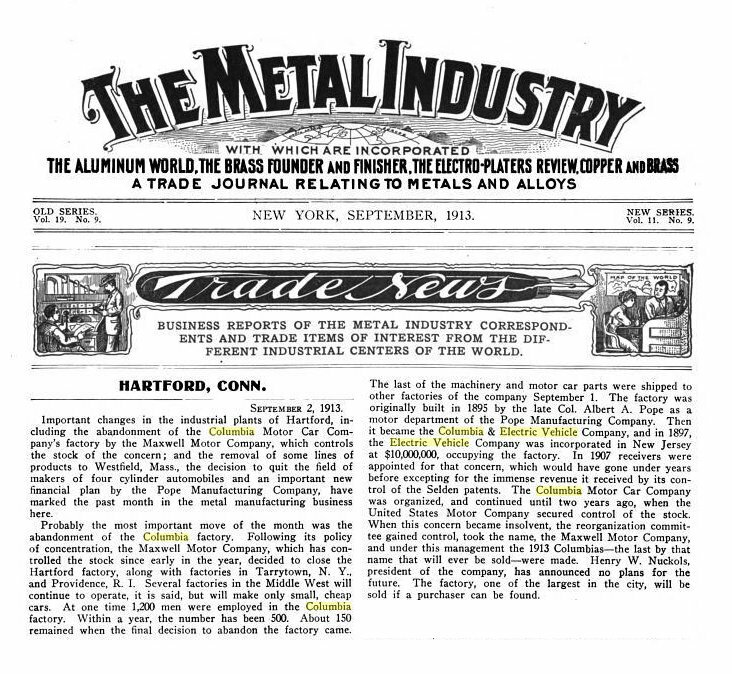 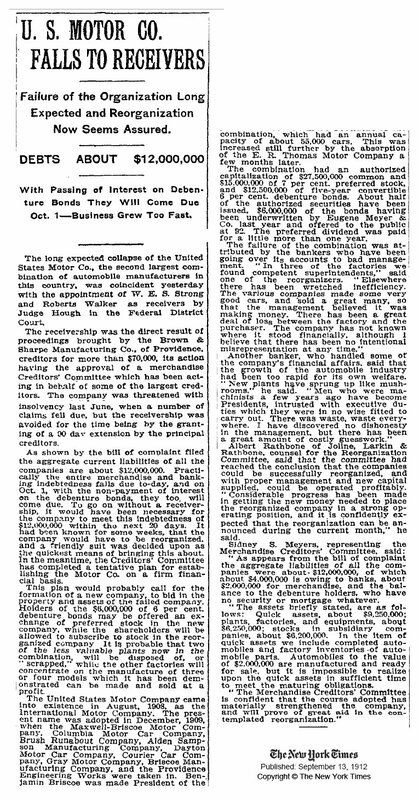 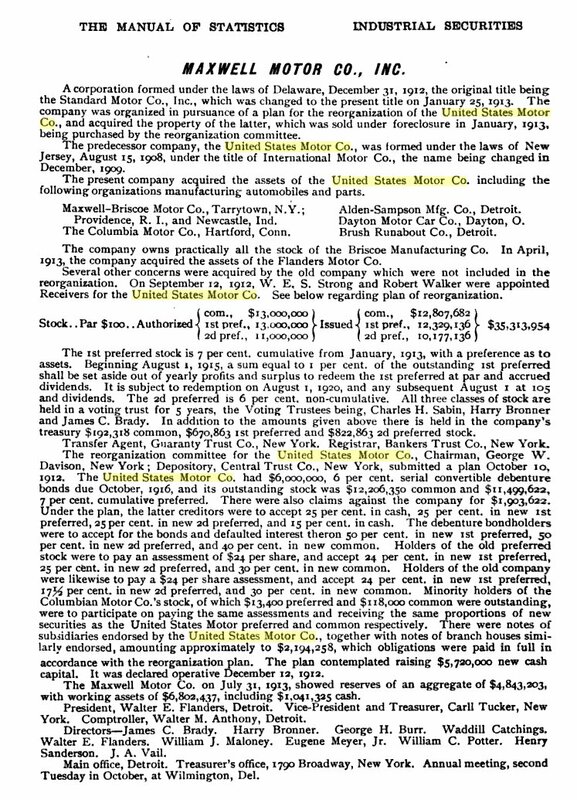 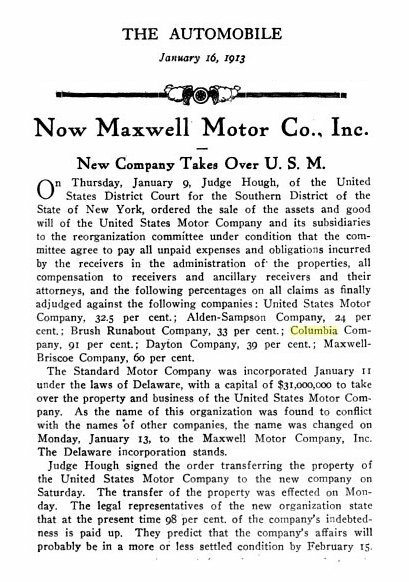 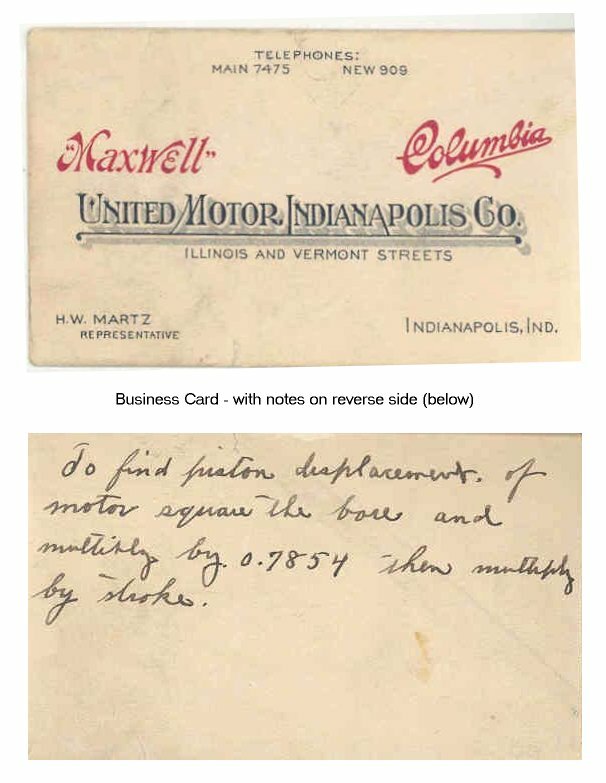 The Maxwell company joined with Stoddard-Dayton, Courier Car Co, Columbia Automobile Company, Brush Motor Car Company, Alden Sampson Trucks, Gray Marine, and Providence Engineering Works to form the United States Motor Company in 1910. 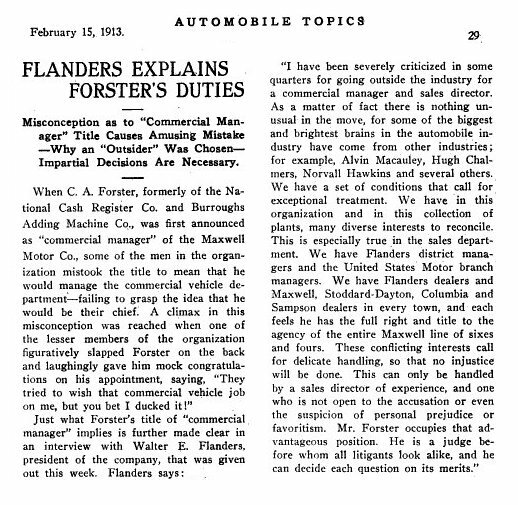 An effort to provide a sales organization for smaller, struggling manufacturers, it was a short-lived effort and the USMC collapsed in 1913. 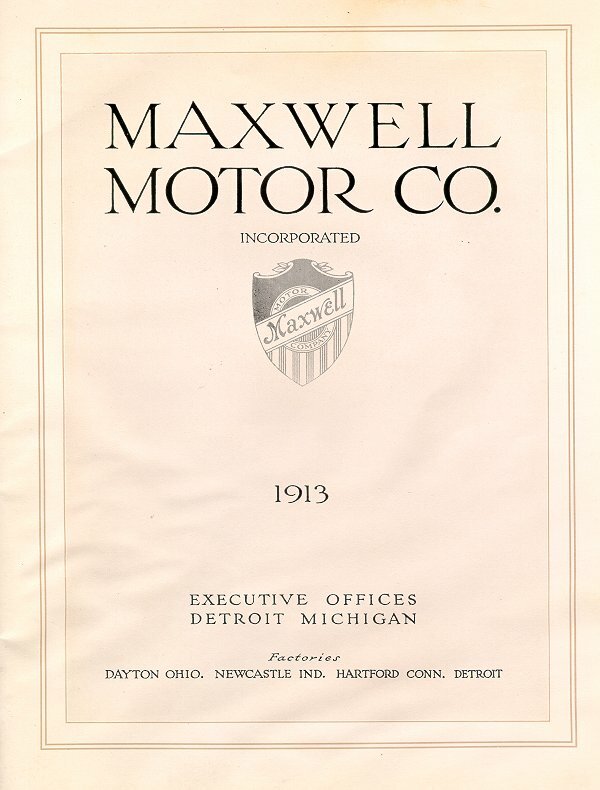 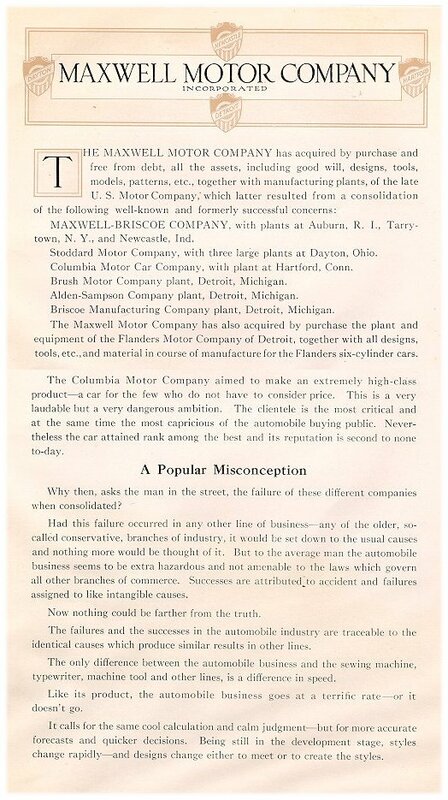 Maxwell, the only profitable component of the company, was purchased by Walter Flanders who established factories in Detroit and Dayton, Ohio. 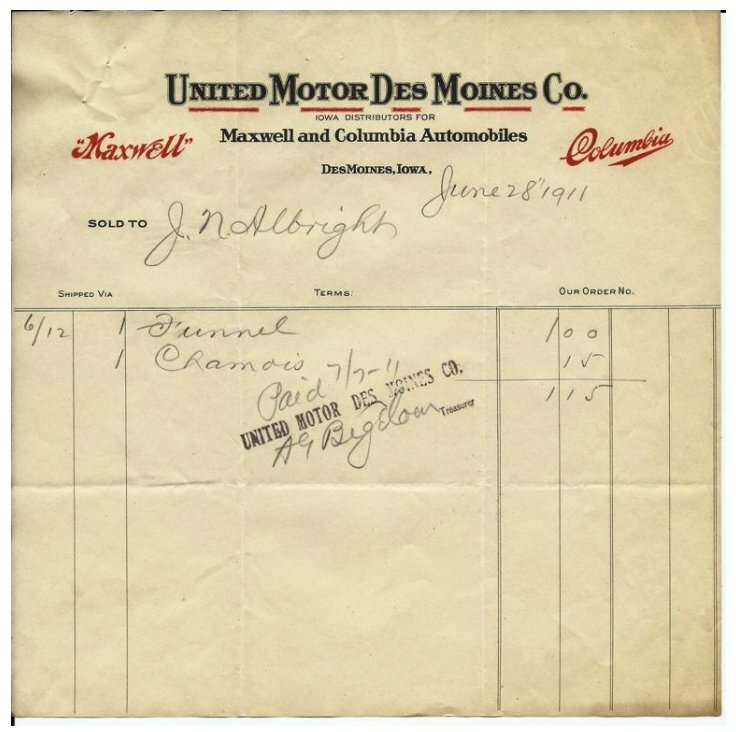 Under this new ownership, the company flourished, producing a range of highly regarded quality cars with sophisticated valve gear, cooling and gearboxes. 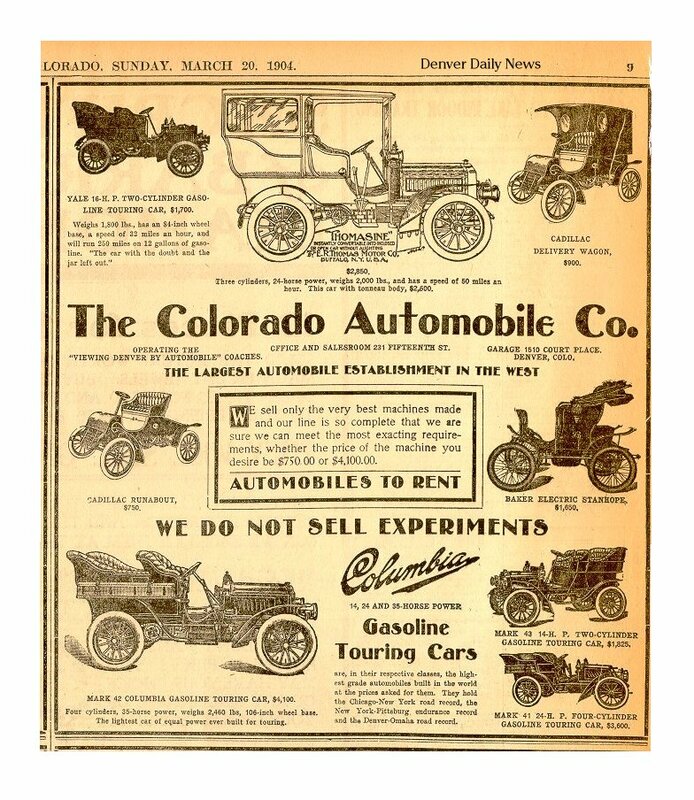 Maxwell cars were also tested competitively, setting a record on ten days, sixteen hours for a cross-country trip in 1916 as well as in a race between Washington, D.C. and Baltimore against the Pennsylvania Railroad's "Congressional Limited" express train. 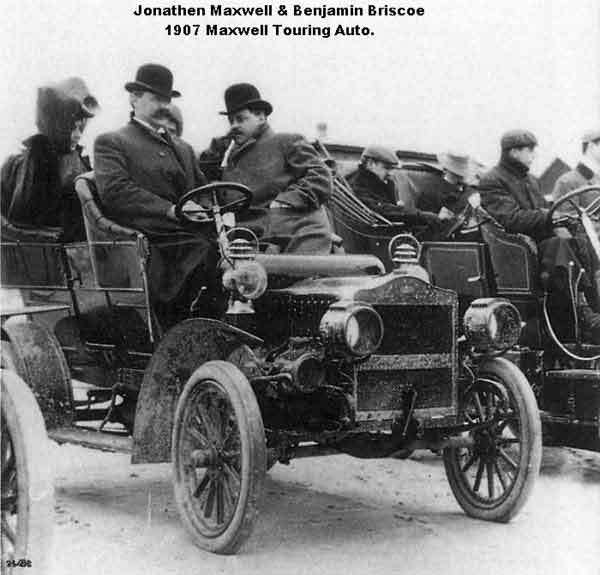 The Maxwell didn't win that one, but only by a margin of four minutes over forty miles. 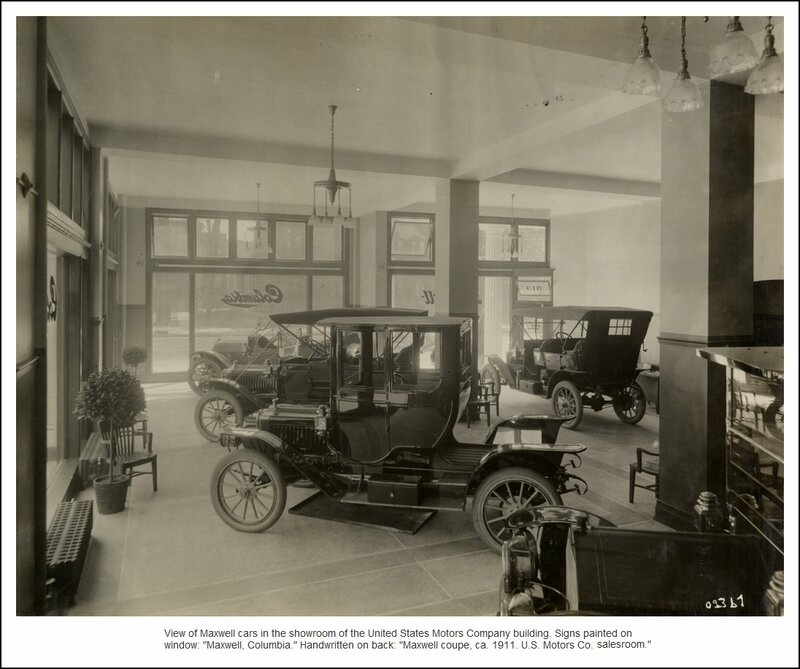 Maxwells also did well in Glidden Tours, frequently besting much more expensive marques. 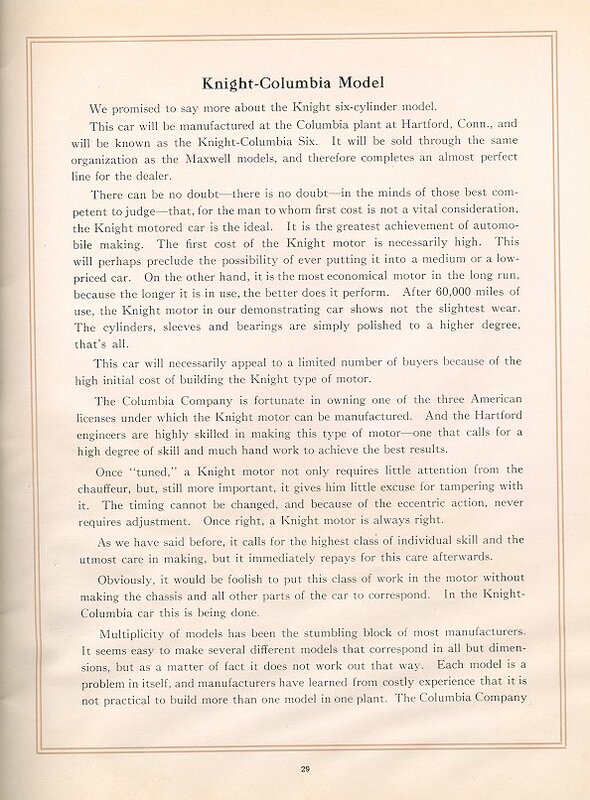 Their reliability was a strength, with the cars often scoring success when other, faster cars failed. 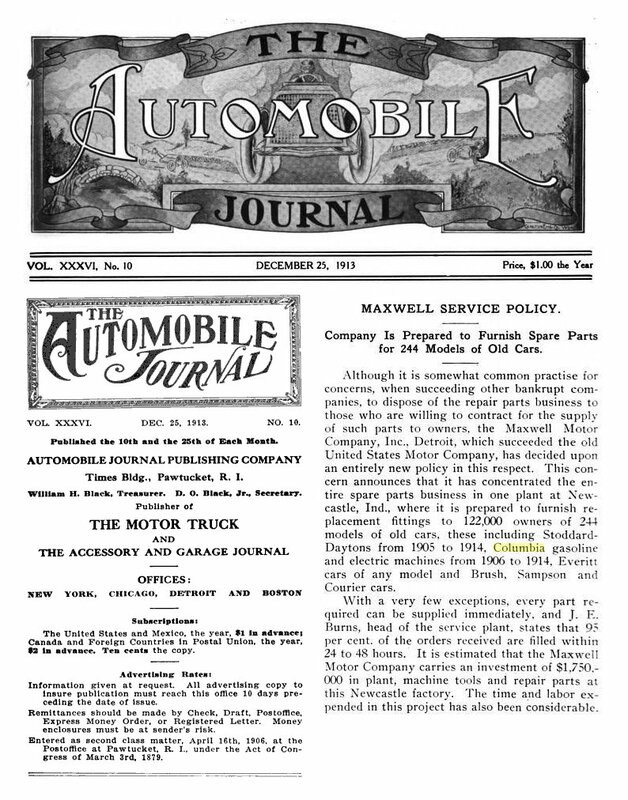 However, in the recession which followed World War I, Maxwell was in deep trouble and in 1921, Walter P. Chrysler arranged to take a controlling interest in Maxwell. 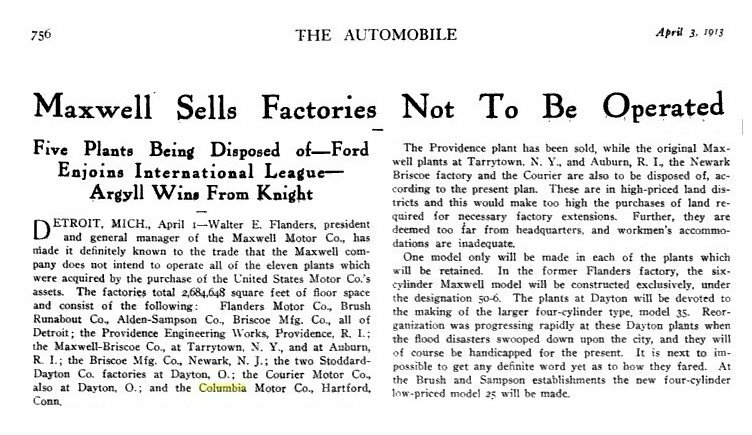 He eventually phased out the name, and what would have been Maxwells became Chryslers and later, Plymouths. 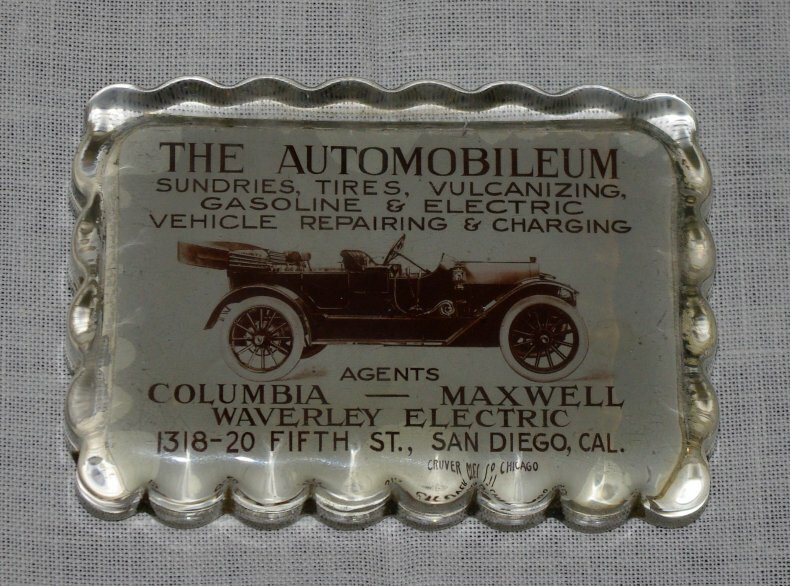 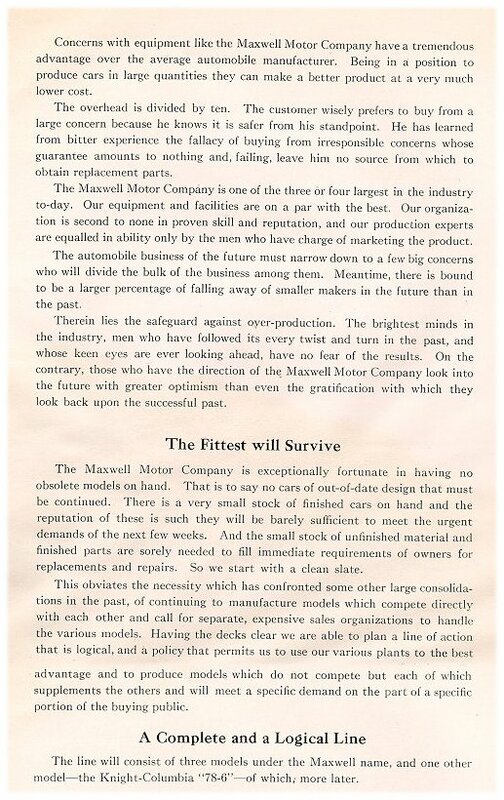 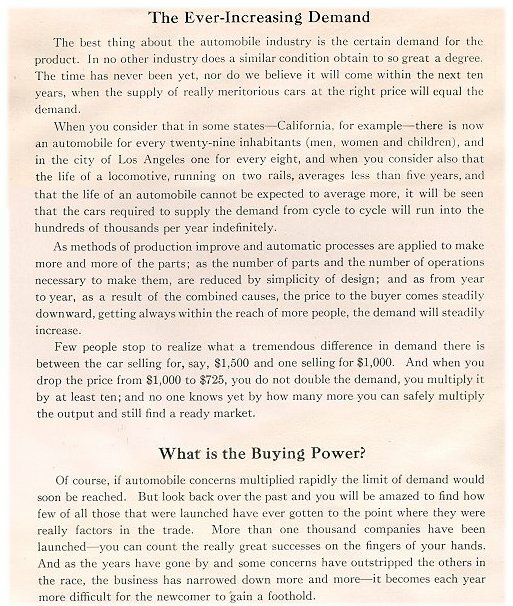 Although almost forgotten today, Maxwell was once the third largest selling automobile in the US, behind Ford and Buick. 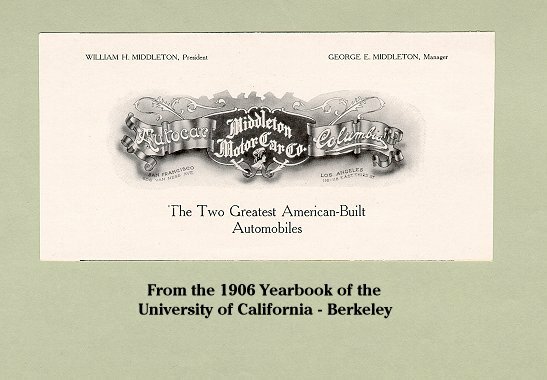 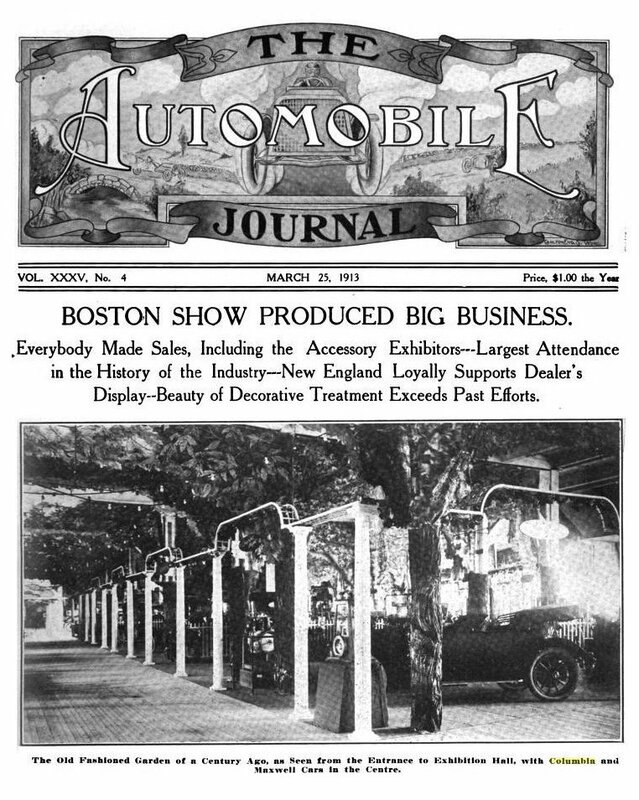 It was one of the most important early American manufacturers and was very highly regarded in its time. 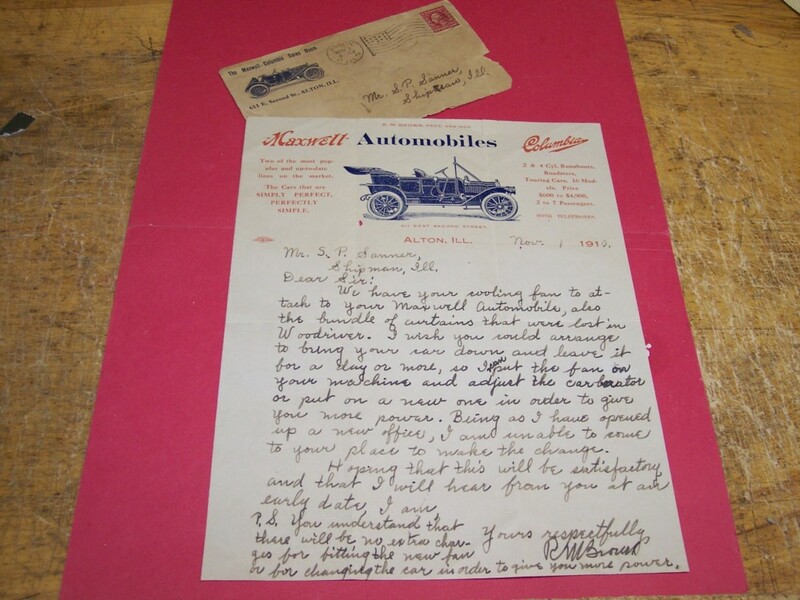 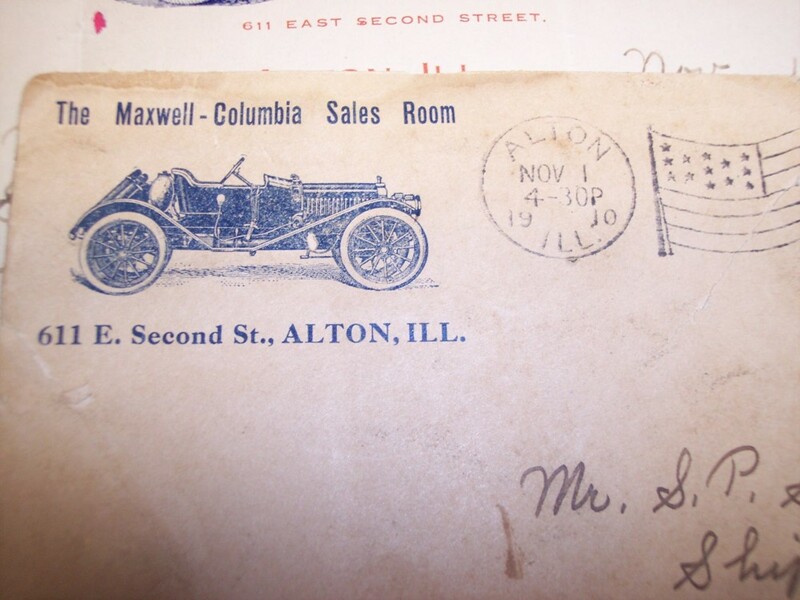 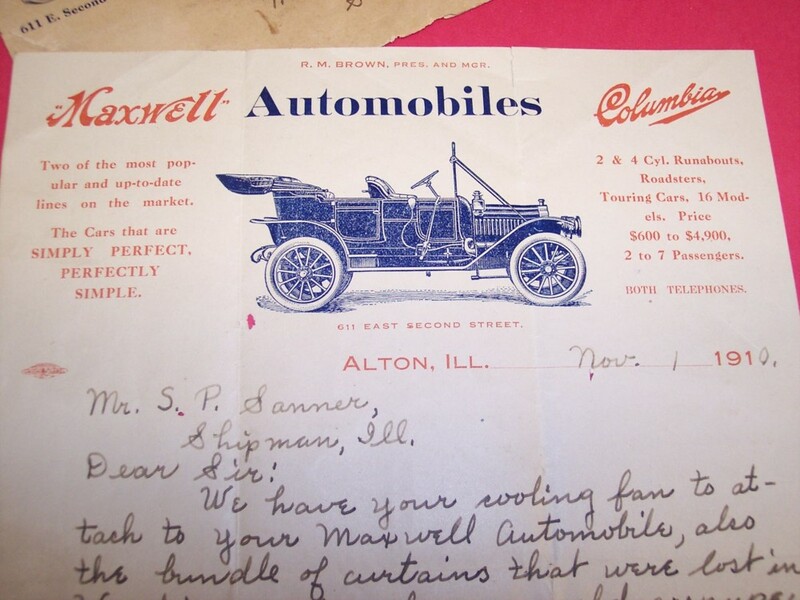 Maxwell was noted for producing cars which were practical, reliable and well built, but with a level of performance and elegance more typical of higher priced models. 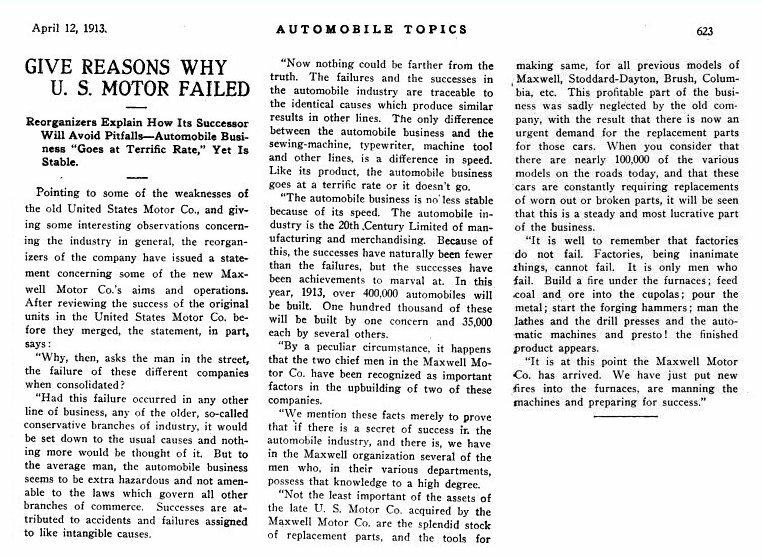 Many may remember that comedian Jack Benny "owned" an old Maxwell- perhaps because of its durability. 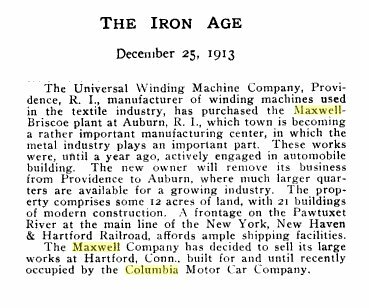 from the 1913 Maxwell catalogue. 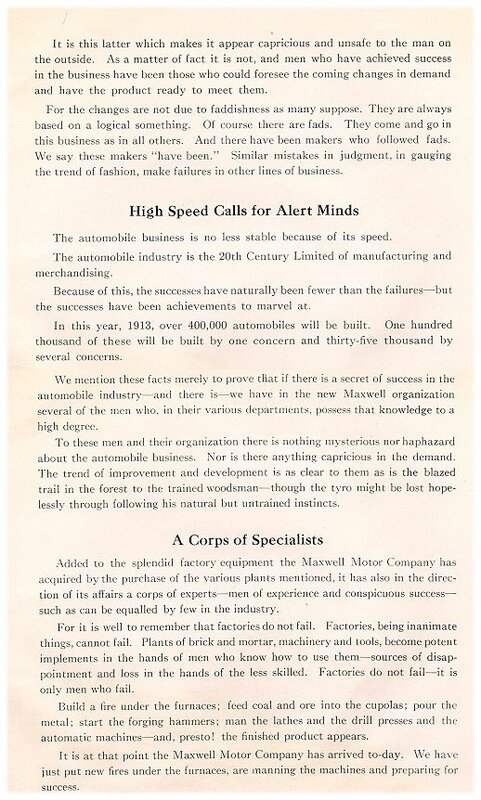 in conjunction with other makes. 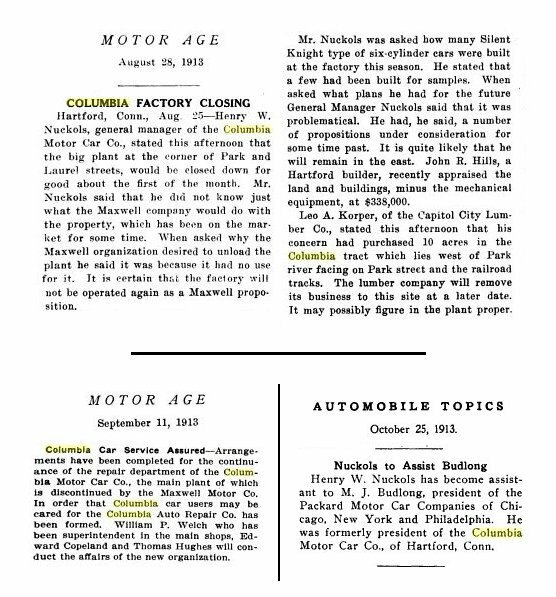 after which time the name became completely defunct. 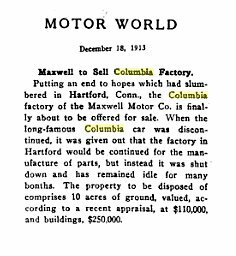 there was a link between Maxwell and Columbia. 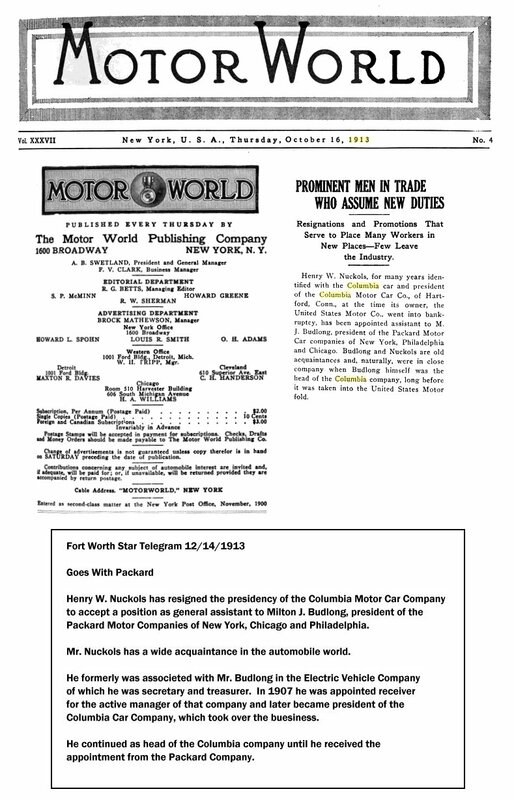 ...and United Motor in Indianapolis and Des Moines..
...and one on the West Coast! 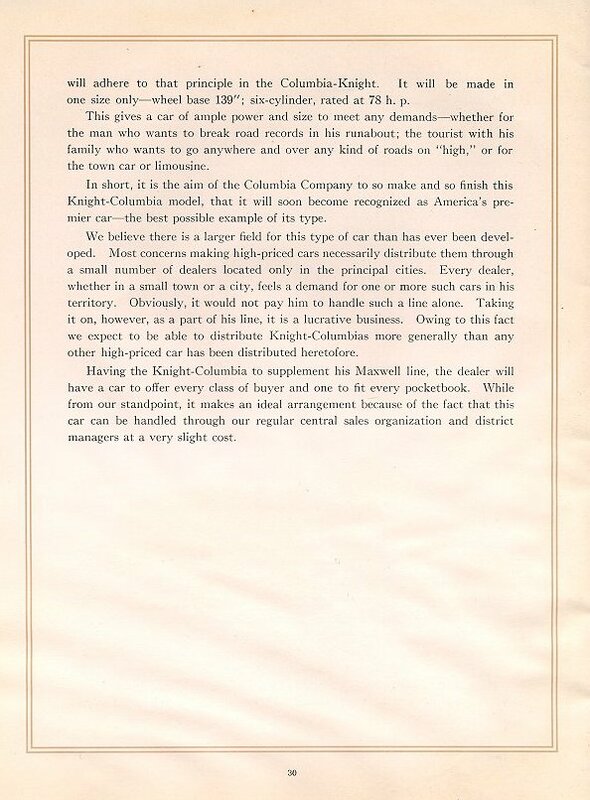 "The Largest Automobile Establishment in the West"
of Columbia cars being driven by people.